Fantastic news!! The Winona Forest Recreation Association was awarded a grant to complete Phase 1 of the 17 mile New Vision Trail Rehabilitation Project. Once completed, Winona Forest will offer dry, smooth paths for trail runners, bikers, horseback riders, or those simply out for a leisurely stroll in the woods. A picnic pavilion will provide a resting place to sit, or grill a hot dog. The new visions project will begin at the Wart Road Parking area summer 2018. Bill's Belly Trail will be our starting point. In 2017, our organization and the NYSDEC worked collaboratively to design and build multiple bridges on this trail. The grant award allows our non-profit organization to continue work to improve this trail for community use. 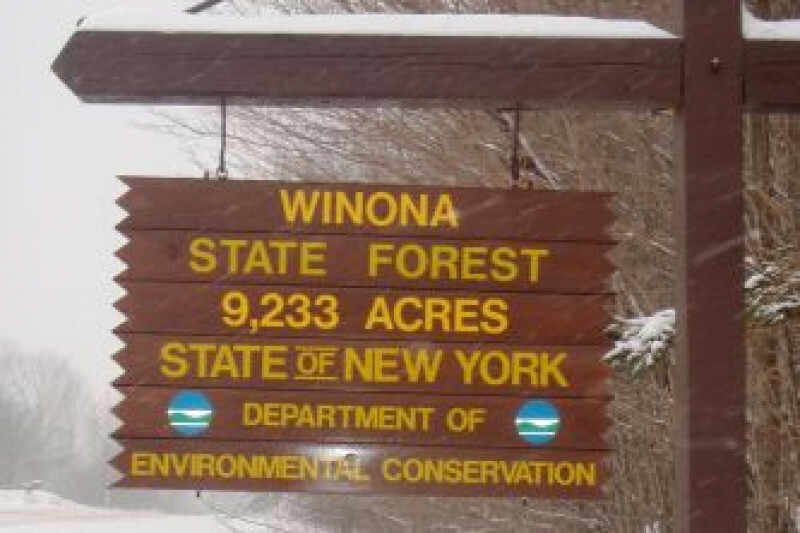 We hope to see our local residents, school groups and cross country teams, as well as folks visiting from out of town, either discover, or rediscover the Winona Forest. Trail materials for several miles of multi-use trail. A newly installed picnic pavilion on Bill's Belly trail. Over 40 loads of stone material to help repair rough wet sections of trail. New signage and sign posts. This project will be completed by volunteers dedicated to providing recreational opportunities for our community, and beyond.